On Saturday the 4th of November, I joined what was the first session of a 4 day short course at The Prince’s School, led by the wonderfully effervescent Samantha Buckley. Sam is an accomplished and celebrated artist who specialises in miniature painting and illustration. From the outset Sam proved to be a generous and patient guide as she took us through the tasks we needed to complete. 1. Image from "Fifty-One Flowers, Botanical Watercolours from Bengal"
The class started shortly after 10am and we jumped right into the process of creating our own botanical Indian miniature paintings. Each student was provided with a sheet of Fabriano Artistico Hot Press Watercolour paper in a 640gsm weight, (approximately A4 size). This is a beautiful creamy white paper, the heavy weight of which will ensure no warping or buckling occurs when we apply various stains and colour washes. The paper was taped to a drawing board using gum tape - not to stretch it, but to ensure the paper remains firmly in place when we are working on it. Once taped down, a tea wash was applied to the paper and then allowed to dry. For those wanting a darker stain, additional layers or washes of tea can be applied until the desired colour is reached. For more information on watercolour paper click here. Once our papers had fully dried, we commenced the burnishing process. Burnishing the paper flattens and seals the fibres on its surface. This prevents inks or paint from bleeding or sinking into the paper and provides the wonderfully smooth surface which is necessary for fine or detailed work like miniature painting or manuscript illumination. An agate stone, cowrie shell, or other smooth stone can all be used to burnish paper. We burnished our papers for a minimum of 20-30 minutes to ensure an adequately smooth surface was achieved. Whilst preparing our papers, each student took some time to review the available images and each of us selected the image we wanted to work on recreating. Replicating a design in this way, rather than creating a new design, or drawing from floral life studies, is an accurate reflection on how miniature painters would have learned their craft many centuries ago. “Masters” would have typically created the designs or original drawings which would then have been worked on or traced and reproduced by their less experienced apprentices. Whilst the book of images we worked from is out of print, there are number of beautifully illustrated books available for those who are interested in botanical painting. I suggest amazon is a good starting point for your own research. Once chosen, our next step was to trace an outline of our image using a soft pencil on to standard tracing paper. 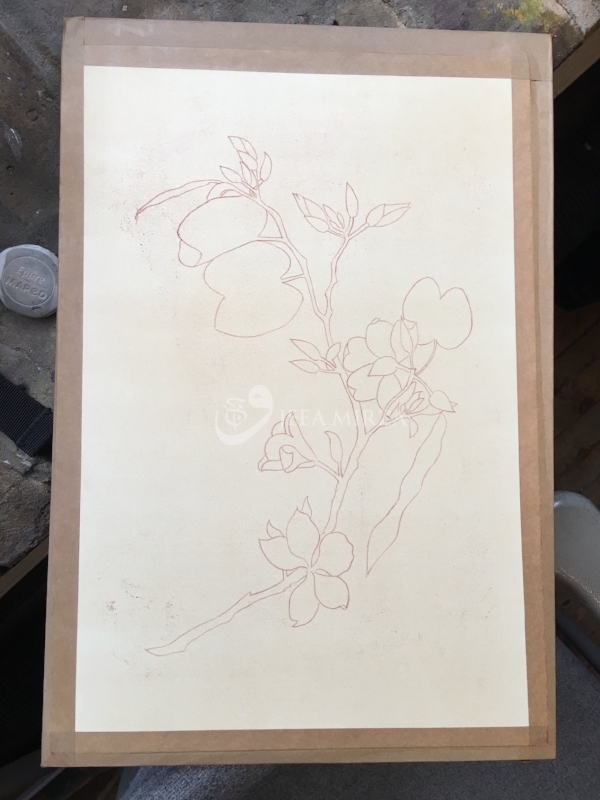 We then rubbed a red ochre pigment on to the back of the traced outline and created a type of “carbon” paper which we then used to transfer the image on to our tea stained paper. Once the red ochre was applied we placed the traced image (pigment side down) onto our tea stained paper and carefully taped the image into place. We proceeded to gently retrace over the lines using a sharp pencil; and so transferred the image onto the prepared paper. The transferred image (shown in image 7) is not permanent at this stage, as the pigment is only sitting on the paper and can easily be smudged off (this will be inked over later to make it permanent). After a short break for lunch, the afternoon session got under way. We started the class by using a traditional Chinese inkstick and inkstone to grind our own black ink. An inkstone is a stone mortar for grinding and containing ink. We added a few drops of clean water to the inkstone; then placed the flat end of the inkstick onto the grinding surface and moved it in a slow circular motion against the stone to produce the ink. More water was added, a few drops at a time during the grinding process until enough ink was produced for everyone. In addition to making our own black ink, we also worked with walnut ink, painting simple graded washes to get a feel for the warm brown tones that can be produced with it. Walnut ink is often used in miniature painting as well as in manuscript illumination for outlining, where a softer or more subtle finish is required. Using a strong black ink for outlining can sometimes appear harsh or can be quite unforgiving if the finish is not up to the desired standard. I was fortunate enough to have my own brushes with me; and was very much out of practise as I hadn't used them for months! We practised making circles, spirals, curves and other marks for at least an hour before we attempted to use the curved brush to ink in the outlines on our actual images. *In a previous Indian miniature painting course that I had taken at the school in 2016, each student was provided with a curved squirrel hair brush to keep, which enabled us to practise at home after the course. I would hope the school reintroduces this practise and provides each student with a brush to keep, as the brushes are not easy to source outside India. As mentioned above, the final task of the day was to use the squirrel hair brush with some walnut ink to go over the pigment lines on our tracing and make the outline semi - permanent. This outline will ultimately be hidden, but it is very good practise to outline the pattern as this will prevent the pigment accidentally rubbing away and loss of line clarity. Equally importantly the painter becomes more familiar with the lines and curves of their image each time they trace over it - so it all counts as great practise! That's pretty much it for the first class - and I am happy to say that I had a thoroughly enjoyable and relaxed day. The pace was comfortable and I think everyone in the class had plenty of time to complete all the necessary tasks in readiness for the next session. In the next class we will focus on grinding pigments to make our own paints. We will then mix the hues we need and start painting the first layers of colour onto our pieces! Safe to say we are all very much looking forward to that! Please do comment below and let me know if you have any questions and if you enjoyed the post or if you found it helpful or interesting. If you did enjoy it, please like and share :-) See you next time!